According to the legend of Romulus and Remus (the twin sons of the War God Mars and the Latin Princess Rhea Silvia), the twins were abandoned on the banks of the River Tiber and then raised by a She-wolf. The legend continues that the two brothers fought violently over who would govern and Romulus ended up killing Remus. Romulus then established the city of Rome on the Palatine and declared himself king. 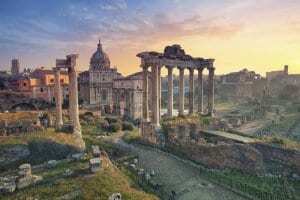 This legendary foundation of Rome was said to be in 753BC. Archaeologists have indeed made discoveries confirming the existence of a settlement on the Palatine in the 8th century BC. After Romulus, Rome was ruled by successive Etruscan kings until the last one King Tarquinius Superbus was overthrown and a republic established in 509BC, The Roman Republic was run by elected officials with a Senate used for checks and balances. Modern day visitors to Rome can still see the acronym “SPQR” all over the city (fountains, coats of arms, facades, manholes), which stands for “Senatus Populusque Romanus”- the Senate and people of Rome. Over time, Rome became incredibly powerful, incorporating new lands and peoples into their reign. However, they were not the only power in the Mediterranean. The Carthaginians (Phoenicians settled in modern-day Tunisia) were their bitter enemies. The Romans attacked Carthage and started the first of the three Punic Wars in 264BC. This was also the first year Gladiator Games were shown in Rome with exotic African animals being used. Hannibal, the feared Carthaginian general, famously led his troops over the Alps into Italy on elephants. In 60BC Rome was ruled by a Triumvirate, which was a tri-powered government led by three famous characters in Ancient Rome: Pompey, Marcus Licinius Crassus (who defeated the slave revolt started by Spartacus) and Julius Caesar. Caesar ultimately became a “dictator for life” but was murdered only four years into his rule on the “Ides of March”, so brilliantly dramatized by Shakespeare. After Caesar came a succession of emperors including his great-nephew Octavian (also called Augustus, the first Roman Emperor and eventual enemy of Marc Anthony). During the campaigns in Egypt, Augustus began to bring over obelisks to Rome. There are 13 ancient obelisks in Rome today! After Augustus came Tiberius, a merciless ruler who was exiled to and then murdered in Capri. Caligula was a thankfully short-lived ruler who was known for being sadistic and probably insane, also murdered to Rome’s great relief. Nero was another megalomaniac emperors who apart from organizing the death of his own sister, is also credited by historians as causing the Great Fire of Rome (AD 64). Needless to say, as the emperors never managed to live to old age, he was also murdered. Vespasian came next and built the fabulous Coliseum on the grounds of Nero’s villa. He also tore down Nero’s famous golden statue of himself. The Flavian dynasty followed. Interesting personalities in Ancient Rome after this included Trajan, whose forum is still intact; Hadrian (117-138AD) who remodeled the Pantheon and built the exquisite villa and gardens at Tivoli); Marcus Aurelius, the philosopher-emperor; and Constantine who declared Christianity the official religion of Rome and its empire in 313AD. Rome fell into decline and civil war cracked and ultimately broke up the empire in 476AD. In 800, Charlemagne was crowned Holy Roman Emperor. Christian power was shifted from Rome to Avignon (France) for nearly the entire 14th century when the papacy was temporarily moved there. The Renaissance which began in Florence and flourished in Tuscany and the Veneto also breathed fresh energy into Rome by the mid-1400s. Botticelli, Fra Angelico, Ghirlandaio, and Michelangelo all lived and painted in Rome. The biggest contribution to Rome was surely the Sistine Chapel’s ceiling, painted by Michelangelo from 1508-1512. Caravaggio also lived in Rome and became quite successful before having to leave town on the run after accidentally killing his opponent in a ball game. The counter-reformation followed and was a period of intolerance and persecution for Protestants, scientists, and intellectuals. Galileo Galilei was famously summoned to Rome by the Inquisition and forced to renounce his theories. The 17th century enjoyed an incredible architectural golden age with such geniuses of Baroque as the Neapolitan Bernini, Borromini, and Fontana. Sculptural masterpieces were built and placed in Piazza di Spagna and Piazza Navona during this period. Puccini wrote the opera Tosca (1900) based on the Napoleonic occupation of Rome. The fearless and ambitious French general crowned himself King of Italy in 1805. The romantic “Grand Tour” became a must do for Northern European writers and artists after Goethe published “Italian Journey” in 1816. Lord Byron, John Keats, and Shelly were among the many celebrities of their day to succumb to Rome’s charms. Keats actually died in Rome, in his apartment in the Piazza di Spagna (of tuberculosis) and is buried in Rome’s “Protestant Cemetery”. After much vicious fighting Napoleon was ultimately defeated and made to go into exile, staying briefly in the Tuscan island of Elba. The “Kingdom of Italy” was coined in 1861 following Garibaldi’s successful takeover of Sicily and Naples. Vittore Emmanuele II became king and Rome was declared the capital in 1870. The 20th century brought years of fascism and hardship to Italy. Mussolini used to give his famous speeches to the masses from Rome’s Piazza Venezia. Luckily the 2nd half of the century saw better times. Rome enjoyed a cinematic golden age in the ’50s and ’60s and the Cinecittá Studios were used to film many American and Italian films including Ben Hur, Spartacus, and Cleopatra. In 1960, Rome hosted the Olympic Games and Federico Fellini released the one and only “Dolce Vita”, which was also filmed at Cinecittá. Interesting to note that at this time, Rome was referred to as “Hollywood on the Tiber”. “Roman Holiday”, starring Audrey Hepburn and Gregory Peck brought us images of the Spanish Steps and scooters zipping around the Coliseum. The last 20 years have seen some important events in Rome such as the 1990 World Cup, the 2000 Jubilee Celebration (attracting 16 million Christians to Rome!) and the creation of Rome’s first mosque in 2005, reflecting the multicultural reality in modern Italy. Breathtaking and exhausting, there is no other city in the world like Rome. Much of modern Roman cuisine is based on Jewish cooking, and while the Ancient Roman aristocrats enjoyed figs and cassata cheese and delicate aromatized wines, these delicacies have not been passed down to the modern Roman kitchen. 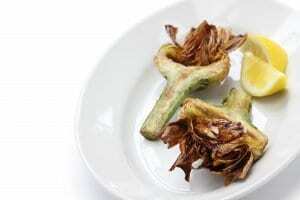 Classic Roman dishes include: “Carciofi Alla Giudia” (Jewish artichokes which are fried whole and served crispy), “Cacio e Pepe” (pasta with black pepper and Pecorino cheese), “Coda Alla Vaccinara” (braised oxtail soup, “Butcher” style), “Fritto Alla Romana” (traditional dish of fried vegetables and lambs brains), “Filetti di Bacallà” (fried salt cod, Jewish dish). “Gratachecche” are wonderfully flavored ices served over Rome, the best one being lemon and coconut, with real coconut slices. The three best neighborhoods to taste authentic Roman cuisine are Testaccio (where the ancient Roman abattoirs were), Trastevere (the most folkloric neighborhood) and the Ghetto (home to many kosher restaurants). South of Rome lies the region of Castelli Romani, full of charming hill towns and seven winemaking areas. Most famous is Frascati, a simple fruity white wine from the same named town. Anecdote – If you find Roman food a little salty, there is an interesting story behind it. Rome was built around the Via Salaria, the ancient “salt road” where salt was harvested and then traded along the Tiber riverbank. Rome is home to some of the loveliest sculptural fountains on earth. “Must sees” include the “Barcaccia” in the Piazza di Spagna, the Trevi fountain (whose water source is an aqueduct built in 19BC! ), the Triton in the Piazza Barberini, the Fontana del Moro and the spectacular Fontana dei Quattro Fiumi (fountain of 4 rivers in the Piazza Navona, built in 1651 when the only known rivers then were the Nile, the Ganges, the Danube, and the Rio de Plata). This quarter lies between the Monte dei Cenci and the wonderful Marcellus theatre within the Sant Angelo district. The Jewish Ghetto was founded in 1555 by Pope Paul IV Carafa and finally abolished in 1870 with the dissolution of the church-state. Nowadays it is home to Rome’s kosher restaurants and some simply beautiful architecture. Rome is not surprisingly, full of Roman ruins, and some gorgeous mosaics. 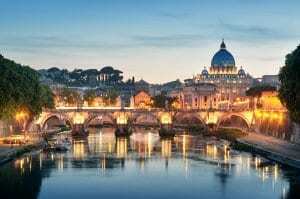 Good places to see these are the 4th century Santa Prudenziana Church, the Basilica of Santa Maggiore, and the medieval gem of Santa Maria in Trastevere. Amazing to find out that for one square meter of mosaic, 10,000 glass pieces (called Tesserae) were needed and set in by the thumb! The Vatican Museums merit a few days alone. The Capitoline museums are three palaces in Capitoline Hill (Piazza Campidoglio) that are full of amazing art and antiquities. The Galleria Borghese is wonderful for fine art lovers (Bernini and Canova sculptures, Tiziano and Rubens paintings, etc). Via Babuino (home to the fabulous De Russie Hotel) is full of boutiques and glamorous shops. Via Condotti is the Rodeo Drive of Rome (Prada, Hermés, Gucci, Bulgari, Ferragamo, Armani, etc). Via Margutta is for art lovers as it is full of antique shops.